if you haven't noticed by now i LOVE baking with tea. 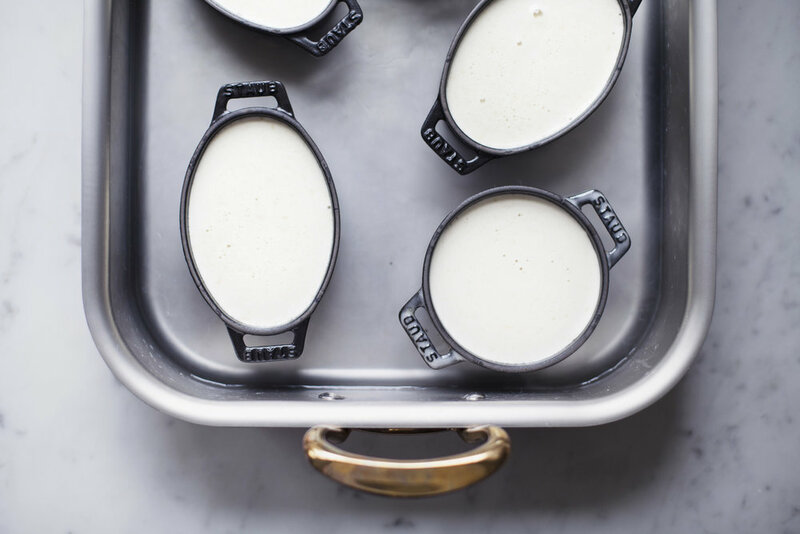 it just takes one simple, additional step to steep the tea in hot milk & any recipe is instantly transformed. 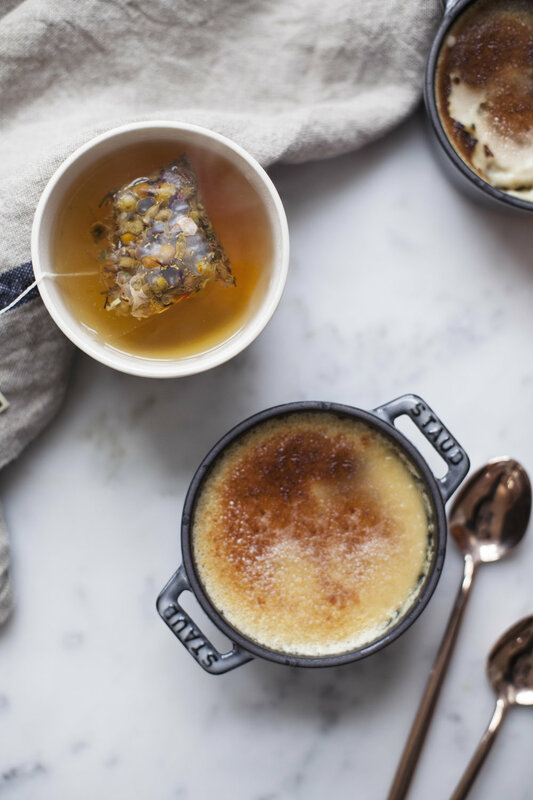 i can't believe until now, i didn't share a recipe for creme brulee made this way! 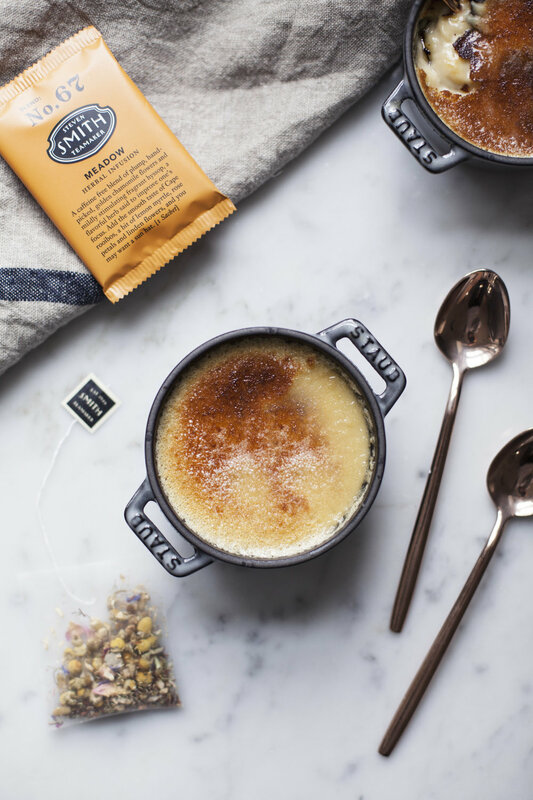 creme brulee is almost all milk & cream (ok just cream), so this would be the most flavourful way to use tea in a dessert. when baking with tea, the quality of tea is very important. 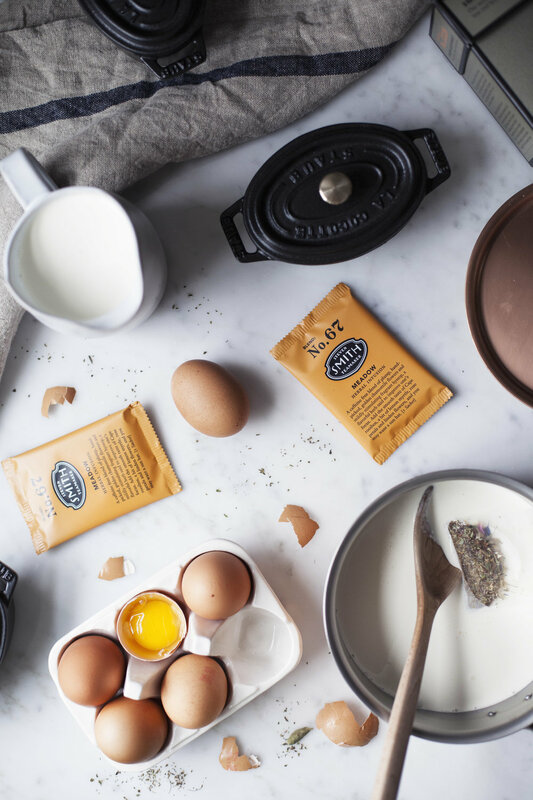 this recipe features smith teamaker's meadow no. 67 tea blend (i also use this blend in a mother's day cake which will be up on the lacanche canada website very soon). 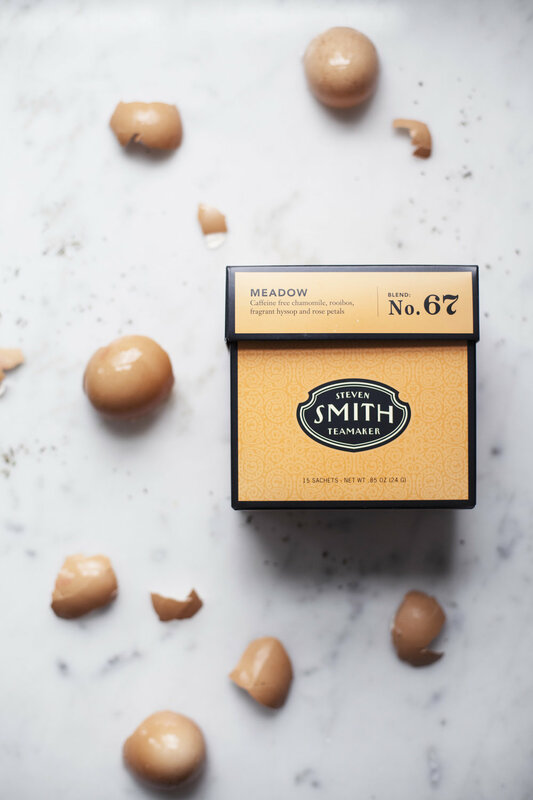 if you aren't familiar with smith tea, they are a portland based company who produces each and every sachet of tea themselves! this helps ensure they produce the very best tea possible. the meadow no. 67 tea is a caffeine free blend of golden egyptian chamomile flowers, fragrant hyssop, rose petals, linden flowers & cape rooibos. it is so dainty & delicate! it makes for the perfect blend to serve mom for mothers day. the tea on its own is so beautiful i had to take a photo of just the tea leaves. who knew tea could be that pretty?! i find tea blends infuse best when they are loose leaf so you can get a stronger extraction. smith's tea sachets are amazing for this because their sachets are very large so the tea has room to expand fully & instead of straining out the tea, you just have to remove the sachet (how easy is that)! P.S. smith teamaker's are offering a discount code just in time for mother's day! receive $10 off any purchase of $50 or more on all smith products including merchandise & limited edition items through mother's day for US & CANADA (yay!) using code modestmarce. you can check out the mother's day collection of tea here & the top thirteen blends here! in a saucepot over medium heat add the heavy cream & tea. bring to a simmer & remove from heat. let steep covered for 15 minutes before removing the tea sachets. in a mixing bowl whisk together 1/2 cup sugar with the egg yolks until light & frothy. slowly temper in the tea infused cream & whisk until blended. stir in the vanilla & sea salt. 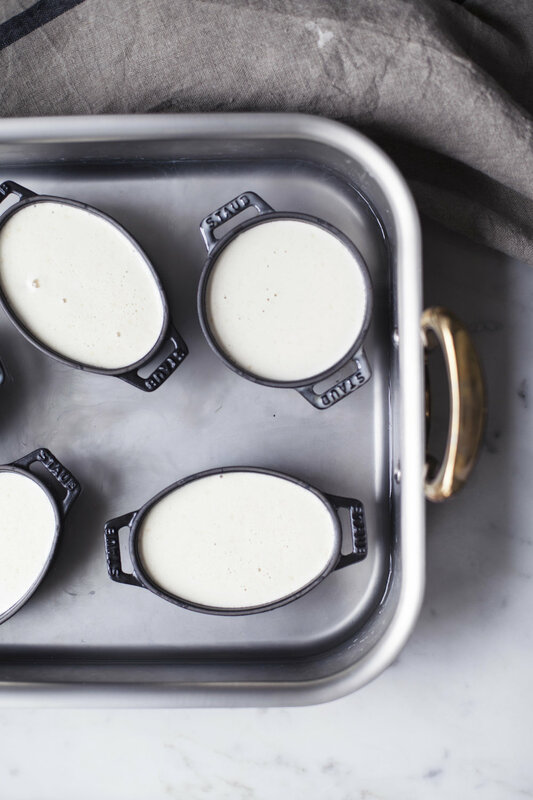 divide the liquid between 6-8 greased ramekins & place in a large roasting pan. fill the pan halfway with water & bake for 45-55 minutes. once ready to serve, sprinkle the tops with remaining sugar & torch the until caramelized. NOTE: if you do not have a torch, use the broil setting in your oven and let them brown for 20-30 seconds. make sure it doesn't burn! this step happens VERY quickly so don't take your eyes off of the oven. this post was created in partnership with smith teamakers. recieve $10 off any purchase of $50 or more on all smith products including merchandise & limited edition items through mother's day for US & CANADA using code modestmarce!! !